Most of us consume too much sugar; the NYC Health Department's Pouring on the Pounds campaign highlights the health risks of sugar-sweetened beverages in a compelling way. It's best to keep the healthy options like water at eye-level in vending machines as that encourages healthier choices. Keep all sugary sweet beverages at the bottom of the vending machine. 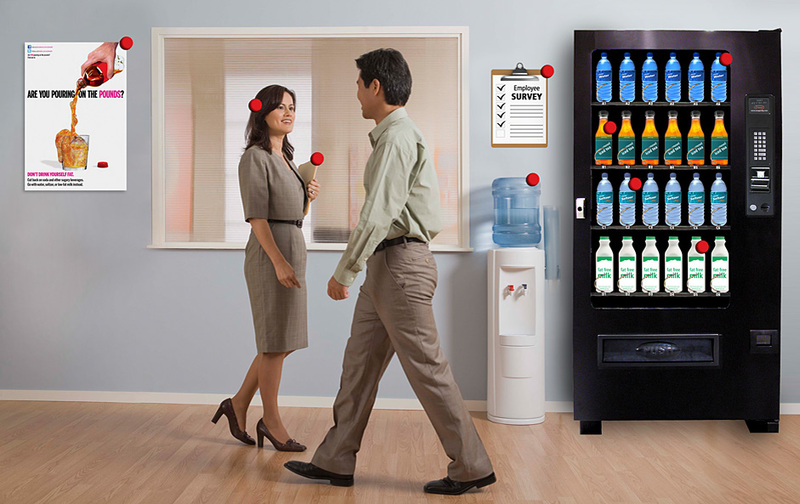 In order to start making your vending machine healthier it's important to consult and start with your purchasing department to gain their support and cooperation as they handle the vendor contracts. Provide an employee survey to find out what your visitors, customers and employees would like to see in vending machines. Based on our results, they want healthier choices! Make sure that water is readily available, especially at meetings. Filtered water stations provide a free alternative for visitors, employees and customers and should be made available with large cups. Encourage vending machine operators to price bottled water lower than sugary beverages. One county's employee survey results show people overwhelmingly want healthy products such as unsweetened iced tea, G2 low calorie Gatorade, Vitamin Water Zero, and other low-cal beverages. The fizzy quality of seltzer makes it appealing! Seltzer is commonly requested by employees and has been reported to sell very well in vending machines, especially health department buildings. Fat free milk provides a healthy alternative to sugary drinks in workplace vending machines. It has protein, calcium and vitamins without the saturated fat in whole milk. Sugar Sweetened Beverages contain caloric sweeteners. Some examples of SSBs are: Soft drinks, fruit drinks, punches, ades, sports drinks, teas and coffees, energy drinks and sweetened milks. NYSACHO’s mission is to support and empower local health departments in their work to promote health and wellness and prevent disease, disability and injury throughout New York State. According to the CDC, consumption of SSBs in the United States is currently estimated at 224 calories per day (11% of total calories) among youth and 203 calories per day (9% of total calories) among adults. On an average day 63% of adults and 80% of youth consume SSB’s. High consumption of SSB is linked to obesity and other health conditions such as diabetes, cardiovascular disease, dental cavities, gout, non-alcoholic fatty liver disease, elevated triglycerides and elevated uric acid levels. The New York State Association of County Health Officials (NYSACHO), responding to evidence that connects obesity and related illnesses to excess sugar consumption, has developed this web site to help NY State residents become better informed, decrease their sugar consumption, and lead healthier lives.